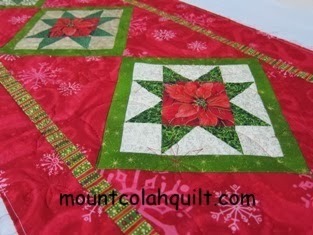 Last year, I made up these blocks from the left over fabric that I used to make the Christmas oven mitts. I ran out of time to put them together then. Luckily, they don't go off.!! 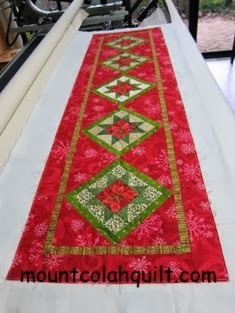 I had a chance to make this table runner to give a fresh Christmas decoration to the living room, just in time before the busy cooking schedule starts. 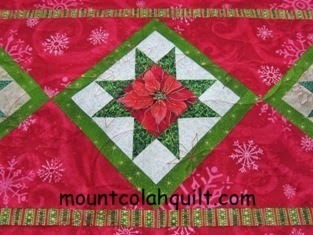 I probably should have custom quilted the table runner, but I thought that I would try out the allover pattern named 'snowy night' by Laurie Thomas.It stitched very well. 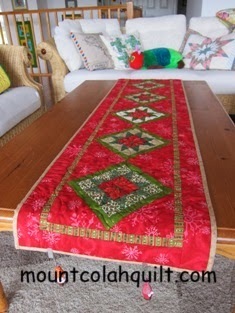 The table runner is now on the coffee table, adding the festive season atmosphere to our cosy home while we are getting ready for the celebrations.